Replacing your tooth brush periodically is a good idea to avoid bacteria build up and to ensure the brush is thoroughly cleaning your teeth. You should get a new toothbrush every three to four months or following an illness. I brush twice a day. Is flossing daily really necessary? Yes! While your pearly whites may look and feel clean, decay-causing bacteria can linger in between your teeth. Flossing everyday removes that bacteria and helps protect your teeth from cavities and decay. What happens during a professional teeth cleaning? A dental hygienist will examine your teeth and mouth for any obvious concerns or signs of gingivitis. A professional cleaning removes calcified, tenacious debris from the teeth that a toothbrush simply cannot remove. The hygienist will then remove plaque and tartar build up and perform a high-shine polish . The session ends with a professional flossing. A professional cleaning is recommended twice yearly. Some patients require a third cleaning each year depending on genetics and dietary habits. This appointment also allows your dentist to document any potential problem areas and catch certain oral challenges before drastic measures – like oral surgery or tooth removal – is necessary. What are the benefits of a routine dental visit? By visiting your dentist every six months, you’ll not only benefit from your teeth becoming whiter, but the cleanings can also provide early diagnosis of other health problems. The dentist is often the first line of defense for systemic illnesses such as diabetes and heart disease. What is the cost of a routine dental visit? The cost associated with a cleaning and oral exam can differ depending on your dental insurance provider and coverage plan. Most insurances cover cleanings and preventative procedures at one hundred percent. Rinehart Dentistry is unique in that it offers in-house membership plans through the Clean Team Savers Club. With a pre-determined monthly fee, you never have to guess how much your services will cost. Each plan includes two yearly professional cleanings and exams. Does a professional dental cleaning hurt? The fear of dental work is common, but completely unnecessary with a cleaning. 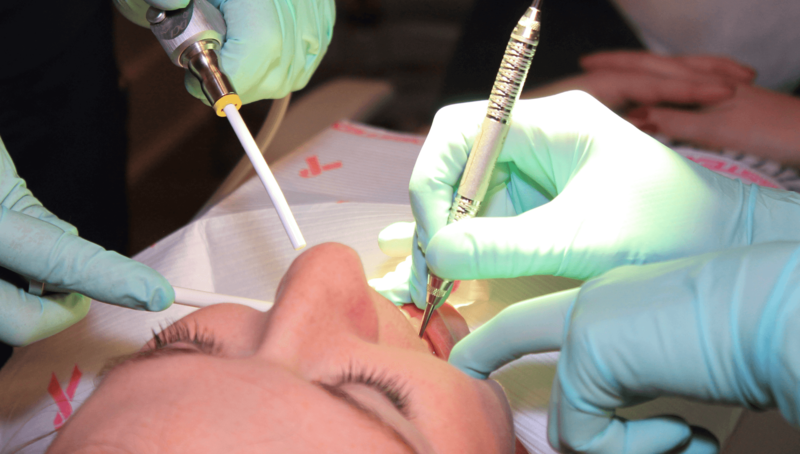 While the tartar build up removal may be slightly uncomfortable, it can often be the noises – scraping, buzzing of the brush – that people associate with pain, but the procedure is usually pain-free. Even the simplest dental visits give me anxiety. Can you help? Of course! You’d be surprised at how dental technologies have developed to create often painless procedures. If you would feel more comfortable with sedation during your visit, speak with the dentist about your options. Here are the sedation techniques we offer at Rinehart Dentistry. How do I keep my teeth clean and white after a dental cleaning? Use your dental cleaning appointment to talk to your dentist or dental hygienist about which products would be best for your teeth. It’s important to maintain brushing twice daily, flossing, and rinsing with a recommended mouth wash.